A few weeks ago, Jason was helping me do dishes when he casually brings up the fact that a kind German couple that was selling some Malamute/Shepherd X puppies offered to give him one. 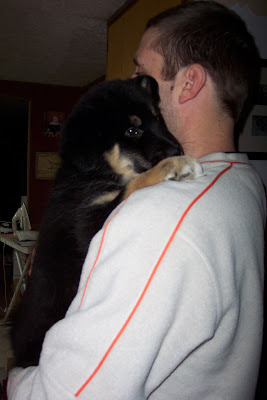 You may recall that when we got Shiloh, I was trying to get a dog well past the puppy stage. This was for two reasons: one, we needed a dog mature enough to actually defend itself--and our property--from the roaming wildlife. And two, PUPPIES ARE A LOT OF WORK!! Now, although we already have a dog that is good on the defensive line, there were new concerns: said already-owned dog still needed a lot of work and training; our yard had a lot of stuff laying around in it that I didn't want to get chewed up, but it wasn't within my jurisdiction to do something about it (nor did I have the time); although the puppy was already a good size, we really didn't have a spot for it to stay warm in the cold weather that would soon be upon us; plus, this dog would be BIG, with an appetite to match--big $. I didn't say much at the time, though. Jason already knew how I felt about it. Two days later, on a Saturday afternoon when we were "out-and-about," Jason casually suggests that he thought we could take the kids to look at the puppies. Not to get one or anything, "just for something to do." Right. I figured he thought one look at those puppies would melt my heart. They were pretty cute, alright. However, we didn't have a puppy in the van on the way home. We had an elephant. We finally did discuss it, though, and the concerns were addressed and dealt with as best as could be. Jason agreed that this would NOT be an inside dog (I hate dog hair on everything) and I agreed that he could get a puppy. The next day he brought it home after work. The first thing he did was put it in our front door! That lasted long! Well, he has been an outside dog for the most part. However, last weekend, with the temperatures hovering around the -40 mark, all the animals (except Shiloh) spent most of their time inside. We have now had Koda for about two weeks. He has a sweet personality, and he has grown a LOT already. 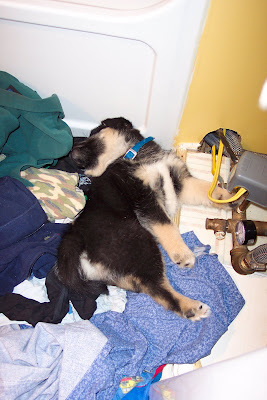 This is where Koda flaked out on his first night here with us (until we put him outside)--right on top of my pile of laundry! That just doesn't even look comfortable! Koda at 9 weeks (a week ago). He's gaining about three pounds a week right now! As puppies go, he actually hasn't been too bad so far. He gets along with the cats (well, not Sumi, but she doesn't get along with anybody!) and he is pretty smart. He made a few messes inside, but I think he's learning about that, too. We are all glad that the super-cold weekend has passed--the temperatures stayed down there for about 5 days. It felt like 3 weeks. Thankfully, we are back up to right around freezing temperature. That means the dog is BACK OUTSIDE!! LOL I'm one of those people who feel the pets are members of the family. Which you know, seeing as my dogs are twice as allergic to the cold as I am. I have to go out in the deep freeze whereas they say, "Yeahhh... I think I'm just going to wait till later." Glad to hear you're enjoying your pets though! Yikes...he's gonna be a BIG one!! Jason better get him "halter broke" BEFORE he finishes growing. Also, you could likely train him to pull the kids around on a sled. That sounds like fun!! B-EG - Yes, I have heard about people like you! :-D I'm too much of a farm girl for that. Dogs are useful. They are even good companions. They will not be appearing in the family photos, though. Dawn - Hee. Good point. However, if we're going to have a "farm", that is pretty much inevitable. Mom - That very thought had crossed our minds. He is already very strong for his size, and we will definitely be training him to feel useful so he doesn't get into too much trouble.